This part of the saga is something like an anthology of shorter works. I’ve heard this structure called a ‘fix-up’ novel, where short fiction is blended into a novel-length story. I’ve been calling it ‘comb anthology’ where short stories are interleaved with chapters of a backbone story. I’ve been writing stories of the Terraforming Project saga since the seventies, and I’ve known from the beginning that they had to be consistent and that someday they would be combined. I have reprinted many of my short fiction in other anthologies, but I’ve been saving the Project stories for this one collection. It was a joy to fit them all together. But I had to have that backbone story as well. After a little thought, I brought one of my favorite characters back on stage. She was the first, from a 1977 short story, and then re-appearing in a novel that we have yet to reach in this time line. So this is very much her story, her memories as she teaches the history of the Project to her students. Now, I’ve been selling the novels under the label ‘The Project Saga’ since Star Time came out, and yet, none of the others ever mentioned the Project. In a sense, this is the first book of the saga and the others were prequels to the Project. But that’s just marketing. They are all part of the same big story I’ve been hinting at since Star Time. From this point on, the Solar System is changed. It’s an engineering project like no other. Humanity hasn’t discovered faster than light travel, and yet it needs more places to live. With the tractor-pressor technology that was adopted from the abandoned engine left in Star Time, it has been enhanced and developed to a power where planets and moons can be moved, and terraforming becomes a usable option. 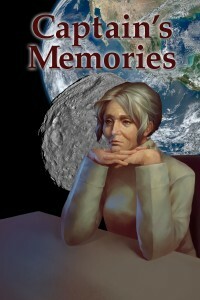 I’ve been writing this story all my life, and putting it all together makes Captain’s Memories my favorite.